The scenery from the hotel is amazing and the pine trees and green areas make it a very relaxing place to be. When asking for a water boiler and to get a 24 hour working air condition they were helpful to fix this for us. The animation shows are amazing with very professional groups, much better than many hotels I've been to before. The food buffet is big and the food tastes good. The Spa is very nice with professional staff from Bali. The coffee corner is amazing with professional barista. Территория прекрасная! Сочетание хвои с пальмами это что-то восхитительное! Кормят три раза в день! Выбор еды очень большой! А какие сладости, выпечка!! Персонал отличный, добродушный и отзывчивый. Спасибо за прекрасные дни!! Красивое место, очень красивая территория отеля, Разнообразное и вкусное питание для взрослых, читые бассейны и территория, интересные вечерние программы, приветливый персонал. Отличная территория, лучшая в Мармарисе. Великолепные сосны, море, воздух, небо - отличная терапия после русской зимы. Приятно было возвращаться в отель и попадать в его свежесть после жары променада. Маленький совет - экскурсии и обмен валюты выгоднее всех у Валентины, рядом с отелем Адлер. 4,5 лиры за $. Везде был 4,3. Хамам $14 и т. Д. . Ну и плюс человек она очень приятный, было ощущение, что есть кто-то свой в Мармарисе. Мы уже прежде останавливались в этой сети отелей Мармариса - года 3 назад. Было очень здорово. В этот раз решили повторить. В целом, было здорово снова - восхитительная территория, вкусная еда, хороший пляж, услужливые официанты, бармены и работники сферы развлечений. Понравилось расположение отеля,сам номер,прекрасный ландшафт и чистое море,в данном отеле остановились уже в Пятый раз. Кофе был отвратительный, но остальное питание прекрасное. 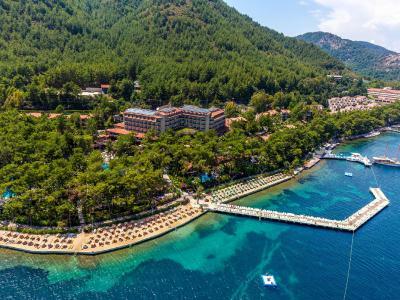 Grand Yazıcı Club Marmaris Palace This rating is a reflection of how the property compares to the industry standard when it comes to price, facilities and services available. It's based on a self-evaluation by the property. Use this rating to help choose your stay! Located on the Mediterranean Coast, Grand Yazici Marmaris Palace offers extensive live entertainment, including music, night shows and a disco. It has a large landscaped garden, an outdoor pool and children’s playgrounds. Each of the rooms is simply decorated and opens onto a balcony, with a view of the garden. They have private bathrooms containing bath tubs. Free Wi-Fi is available throughout. Guests can dine at a choice of restaurants and cafes either outside beside the Mediterranean Sea, or in an elegant dining room. There are 6 bars including the lobby bar, which is open 24-hours a day. There are water activities available upon request, such as jet skiing, para sailing or surfing. For a more relaxing day guests can play table tennis, mini golf and backgammon or request a massage. The Grand Yazici is located just 10-minutes’ drive from Marmaris. From Marmaris a ferry runs to Rhodes, just 45-minutes away. When would you like to stay at Grand Yazıcı Club Marmaris Palace? Each bungalow opens out onto a balcony with a view of the garden. They contain private bathrooms with a bath tub and shower. In this bungalow, the living room and bedroom are interconnecting. Grand Yazıcı Hotels, combining the blue and green of Marmaris, begin enchanting you from here: Here comes Grand Yazıcı Club Turban. 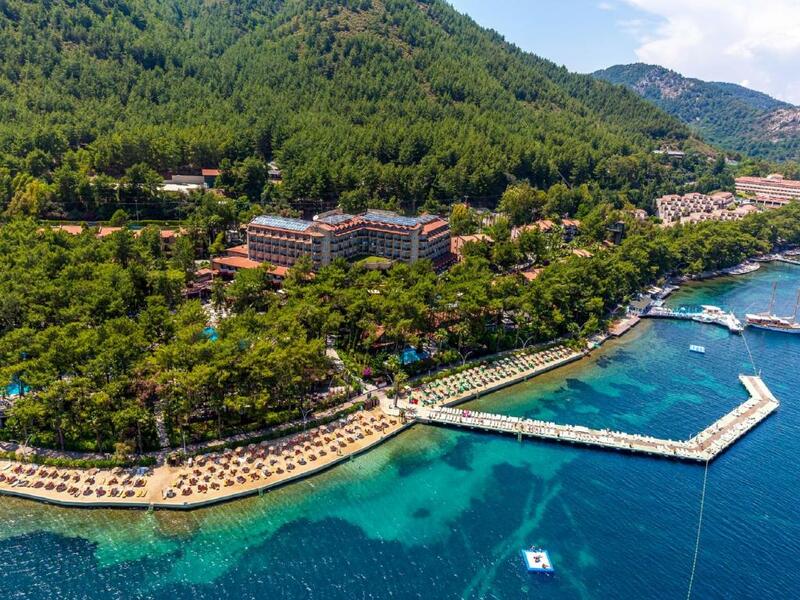 It is a place where you will find the peace you seek for with its location revealing the deep blue waters of Marmaris, with its pine scent and singing birds integrates you with nature. Grand Yazıcı will offer you the first class holiday joy with its atmosphere where its experience and background is united with today’s trends and delights. If you dream both relaxing and having fun, Grand Yazıcı Club Turban is a heaven hidden especially for you. House Rules Grand Yazıcı Club Marmaris Palace takes special requests – add in the next step! Grand Yazıcı Club Marmaris Palace accepts these cards and reserves the right to temporarily hold an amount prior to arrival. Not satisfied with the cleaning staff. First day they took dirty towels and folded them and put them back where they were. Had to complain two times before the room looked decent. There are also no shower equipment or shampo/conditioner/shower cap and all these stuff that you expect from a 5 star hotel. There was no water boiler either. The air condition stops working at 10 pm which is ridiculous. The staff in general were not as helpful and smiling as I'm used to at other 5 star hotels. The receptionists were not very helpful and couldn't answer many of my simple questions. The woman in the guest relation counter seemed annoyed when asking her questions. Our bed was too small, the air conditioning was very inefficient, the food was below average in taste.